Machines that can roll out dough and fondant are handy items to have in both home and commercial kitchens. Large commercial models are often labeled as actual fondant rolling machines, but home bakers typically use small machines originally meant for pasta or dough to achieve the same result. Depending on your budget, space, and needs, consider using a commercial grade fondant rolling machine or a smaller option, like a pasta maker, for rolling your fondant. Buying used is another way to get the rolling machine you desire, but know there can be drawbacks to saving a few dollars. If you're an amateur baker and enjoy making fondant cakes for friends and family, you probably won't want to invest in the space or cost of a larger commercial machine. In these cases, it's good to look for pasta machines that will do double-duty. Though not as high-quality, they are fine for occasional use at home. 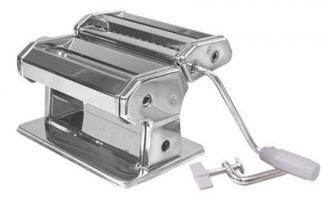 Roma 6" Traditional Pasta Machine - Walmart sells this small pasta and fondant sheeter. It clamps to your tabletop and needs to be hand-cranked. At under $30, it's a good option for home bakers who want to easily roll fondant for creating decorations to add to their cakes. A satisfied customer commented that "This is a great product to use for gum paste and fondant". Marcato Atlas Wellness 150 Pasta Maker - Amazon sells the Atlas pasta maker for around the $100 mark, depending on color choice (there are eight options). It also clamps to the table using a vice and is hand-cranked. One customer noted that it "it does well with fondant." Atlas also offers a motorized version for about $170. 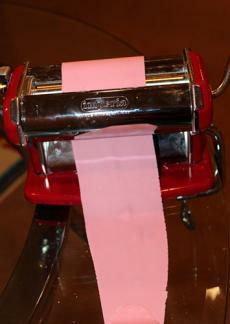 Gumpaste Sheeter (Pasta Machine) - Flour Connections sells a 7" sized hand-crank pasta roller for under $50 that is suitable for use with gum paste, fondant, and other doughs. It has nine different thickness settings. A customer notes that it works "great" especially for creating flowers fast. Machines for busy home bakers and commercial business are often expensive and large. Even tabletop options can cost into the thousands of dollars. You'll also need a large area for storage for these options. Email each company to get a price and shipping quote on products. Buying commercial options from wholesalers may require you to have a business ID or other form of business identification to get the wholesale pricing; buying through public retailers will be significantly costlier. Somerset CDR-500F - The Somerset 20" machine for dough and fondant sheeting is stainless steel, with options for adjusting the thickness. It is a smaller, more compact choice, weighing around 150 pounds. 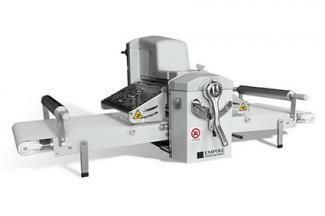 Easy Table Top Reversible Dough Sheeter - Empire Bakery Equipment sells a table top unit that features folding sides for more compact storage. It can handle up to 14 pounds of dough and while it is a tabletop option, it weighs nearly 400 pounds. Manual Dough, Pastry and Fondant Roller/Sheeter - Pie Designs & Solutions sells the 2012-01 model that also sits on a table. This is a hand-crank sheeter that weighs approximately 35 pounds. However, it is sold out of South Africa, meaning there may be additional costs for shipping and customs. Electrolux Dough Sheeter - The Electrolux model 603538 dough sheeter is a large, belt-driven sheeter for bakeries and other businesses. It has two speeds and can sheet up to 600mm of dough across. It weighs over 500 pounds. Use the company locator tool to find dealers in your area. Used commercial rollers can be purchased from bakeries that are going out of business or upgrading their equipment. You can also find them on resale websites such as eBay although selection and pricing will vary as pieces are bought and sold. Keep in mind that while you may get a great deal, especially on free-standing commercial units, the product may not be in perfect condition and it could become difficult to find parts for older models. If you frequently work with fondant, you'll want to consider the pros and cons of purchasing a machine instead of using your rolling pin. In bakeries where large wedding cake and special occasion orders occur weekly, or even daily, a dough sheeter cuts down on labor and expenses. Even small-sized sheeters can cut time and labor for making sheets to use as ribbons, bows, and cutout shapes. Don't forget to check the warranty information. If fondant isn't mentioned in the manual as a use, get it in writing. Otherwise, you may not be covered for potentially expensive sheeter repairs. Rolling out flat, even fondant is time-consuming and difficult. Cut down on your labor and get uniform fondant pieces by purchasing a rolling machine to do the work for you.